« Bed side statistics and numerical fun ! When calf muscles can double up as LV assist device . . .your patient saves a million ! Every day thousands of hearts end their life due to terminal heart failure . Much more lives are confined to their bed rooms.In refractory cardiac failure and severe LV dysfunction the only long-term option is cardiac transplantation. Medical therapy has reached its saturation point. Neuro- humoral modulation shows some promise. The other modalities like cardiac resynchronisation ,LV assist devices , ventricular reduction surgeries , restriction devices , mitral valve splinting are still experimental . Modern day cardiology is trying to add life to these dying hearts . This is the purpose of the mushrooming heart failure clinics all over the world . These clinics , though started with good intention , ultimately become feeding centres for so many experimental bridge modalities , sometimes with an infinite wait for a potential donor or at the mercy of their insurance companies . (Many time it turns out to be a bridge to heaven as the patient fails to cross it !) . Even though there is strict criteria for terminal heart failure , in practical terms it has many issues .Temporary functional deterioration is misinterpreted often . Premature dependence on LV assist devices and indulgence in inappropriate mitral valve reconstructive procedures are the currently most important pseudo cardiac interventions . ( Myosplint/AV groove tying etc) Some where along the academic corridors , we failed to realise many patients can bridge themselves to a transplant (or even self de-list from transplant programme ) provided we are willing to wait and take few risks . It is observed exercise training programme is awfully inadequate in most centres who deal with late stages of cardiac failure. Skeletal muscle function is impaired in cardiac failure . This impairment is attributable to both dis-use and low cardiac output. Proper training of these muscles can not only improve the functional capacity but also sets in a positive hemodynamic cycle that ultimately improves cardiac function as well. In our country we have data of thousands of patients with severe LV dysfunction living with the much ridiculed digoxin , diuretics , ACEI and minimal exercise living a comfortable life for over 10 years . It is often said in cardiology class rooms , do not whip a tired horse as the failed heart needs rest .This statement has truth in it even in this space age cardiology ! Whipping a failing heart with electrodes in the name of CRT could be as bad as whipping with inotropic agents . This is not a personal joke ! This fact has been repeatedly proved by various inotropic studies in terminal heart failure(Dobutamine to be specific ) Even CRT is a suspect .These patients walk for 30 meters further with no convincing survival benefits . (Of course it requires a ICD -Combo to prevent sudden deaths ) Zero impact in non sudden deaths ? Can we propose a new therapeutic concept to our patients ? Do you want to live with a low functional capacity (Restricted life still happy ) for 5 years or live apparently unrestricted life and die prematurely ? Peripheral mechanism in cardiac failure. We know cardiac failure is not a simple mechanical failure of heart , it activates a complex neuro endocrine system which makes it a systemic disorder .Many of the current research is aimed at favorably modify this. It is now certain Skeletal muscle function is a major determinant of cardiac failure outcome and hence a therapeutic target . If you have good muscle mass , good diaphragm and intercostal muscles one can compensate the compromise inflicted by the heart to a large extent. We know, the entire vascular tree has a mechanical function to do . The stiffness and compliance of aorta , other major vessels, the muscles through which these vessels traverse determine the ultimate efficiency of circulation.We know the pulse wave , as it travels to the periphery , gets amplified. This amplification is not without any significance. It aids in muscle blood flow . This agumnetation is missing in poorly trained cardiac failure patients. Further muscle respiration is synonymous with functional capacity . Numerous defects (Both structural and functional ) in skeletal muscle mitochondria are reported. Strangely there is no comparative studies between calf muscle efficiency and other available modalities in cardiac failure . Skeletal muscle mass acts not only as venous pump it also has a modulating effect on the arterial pulse transmission .A good venous pump will activate vascular tone . In congestive heart failure a the RV filling pressure is raised, blood tends to move sluggishly in right heart chambers . A proper venous tone can alleviate this . Well trained calf muscle can exactly do this by a controlled elevation of IVC pressure at times of exertion . The symptomatology of cardiac failure has an intimate realtionship with skeletal muscle integrity ! Lactate in blood and hypoxia in exercising muscles can trigger non hemodynamic dyspnea . Further , there is strong reason to believe the sensation of dyspnea is perceived at the chest muscle level (By muscle spindle length/tension mismatch ) .It is not known whether lower limb muscles can generate a feeling of dyspnea ! But , one thing is certain by altering the tone of the muscle spindle and the optimising the stretch signals the peripheral component of cardiac dyspnea can be significantly neutralised . This is what happens in well-trained cardiac failure patients . Simple 6 minute walking three times a day will help . 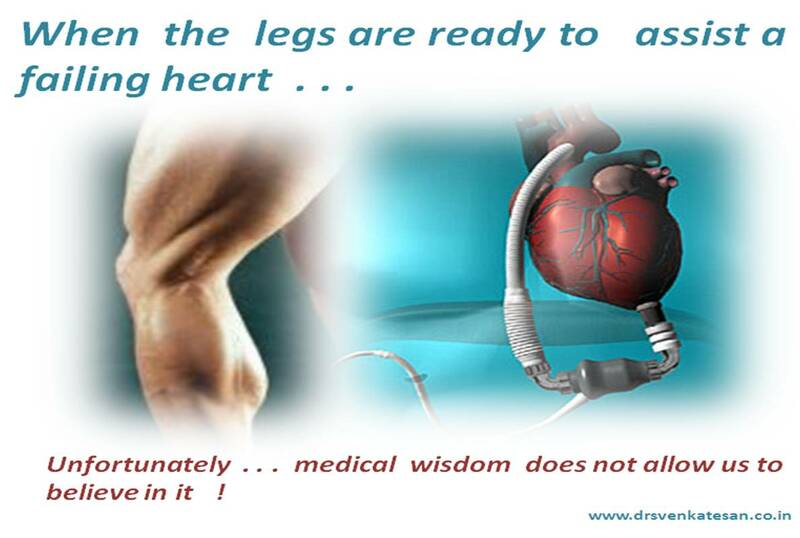 Skeletal muscle training in cardiac failure could be as important as the digoxins , diurteics and ACEI .When a 300 grams of heart muscle is struggling , God is willing to help it with huge muscle mass that lies elsewhere , we should read the silent signals of nature . Many cardiac failure patients realise this and live a happy live without artificial assistance .This applies in all grades of cardiac failure . For all those physicians out there in modern hospitals who treat cardiac failure , spend at least few minutes for prescribing a good exercise program with a specific mention about calf muscle function . After all , it may turn out be the most efficient RV/LV assist device !